As expected, Sprint's new Boost Mobile Family Plans launched today. They offer discounts of up to $75 per month for customers with multiple lines of service. Unlike Boost's previous Family plans, which were only offered at Boost dealers, the new ones are also available online. Current Boost customers can switch to a Family Plan using the My Account section of the Boost website. Customers who switch to a Family Plan mid month will lose any remaining airtime. The Boost site lets users schedule to switch at the end of the current month to avoid losing paid for service. New customers can choose a Family Plan when they activate their phone online, in store or by calling Boost. The first user to sign up is the primary account holder and can invite friends and family members to join their plan. You need to know the other person's Boost phone number to invite them. Be careful who you invite as the primary account holder is responsible all recurring monthly payments for all members of the Family Plan. For current customers joining a Family Plan, Boost will apply a pro-rated credit for unused days of service to the primary Family Plan account. All plans include hotspot and unlimited music streaming. The $35 and $45 plans include unlimited 128 Mbps data after the first 2 GB or 5 GB of data is used. Unlike Boost's similarly priced single line plans, the Family Plans do not include the "Growing Data" feature which gives users 500 MB per month extra for every three online payments. They also don't include Boost's "Grace Period" perk which gives customers 60 days of free incoming calls and texts if when they don't have sufficient funds to renew their monthly plan. The first line is also eligible for a $5/month auto pay discount. That means that five lines on the $35/month 2 GB plan would cost $95 per month after Family Plan and Auto-Pay discounts. At first glance, Boost seems the cheapest. However MetroPCS and Cricket prices include all taxes, even sales tax, e911 fees and California's new MTS surcharge. With Boost, the customer is liable for all state and local point of sale taxes, which can range from zero to close to 25% depending on how greedy your local bureaucrats are. If Boost really wants to compete with Cricket and MetroPCS in all markets, they need cover all taxes too. Wow what a deal. Boost works great here in Miami. Thanks again, and I really liked your second to the last sentence. At 2 lines and 3 lines its actually better not to get a family plan because of the auto-pay discount (on each line) and growing data. The family plan only allows one auto-pay discount and NO growing data. 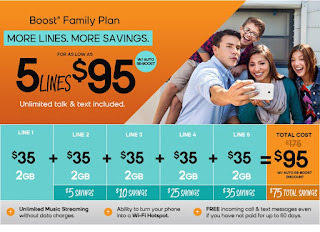 The family plan is $5 cheaper, but you lose growing data and grace period. Once again Boost offers a plan with less value. Misleading poster bullets, the tethering is an extra charge, right? Also music streaming is free on a small list of services. The last one is true. Hotspot is include in the new family plans but not on the old ones. Music streaming does not use your data if you used the following services Pandora, iHeart, Slacker, Milk Music and there another but dont recall the name. So it does. But in the fine print at the bottom on the same page that image came from, it says "Growing Data and Grace Period not available on Family Plans". "Grace Period" is Boost's term for free incoming for non-payers. I think Boost's Marketing Department probably copy and pasted the "Free incoming.." part from Boost's single line plan pages. does anyone know if metro or cricket have unlimited throttled data after using the high speed data like boost? Yes, MetroPCS and Cricket have unlimited throttled data after the high-speed portion is used up. The OP was obviously asking about MetroPCS and Cricket's limited plans not the unlimited ones. I've had boost for years and add funds to pay my account every month with a prepaid boost card from 7-11 and I never pay taxes or fees on top of the monthly fee so why would boost charge taxes on top of the family plan monthly fee? are you sure about this? You must be one of the lucky few that lives in a state that doesn't tax prepaid airtime. thanks for all your answers Dennis. I'm in NV so does that mean i can continue buying the prepaid boost cards from 7-11 and not pay taxes if i get this new family plan? Yes, it looks like there are currently no point of sale taxes on prepaid airtime in Nevada. You should have no taxes paying Boost directly including using autp pay. Boost use to only charge for what your payment is.if you paid in a boost mobile store. .
Metro will charge $3 when you pay in their store and no discount for autopay. Boost Mobile here in Moreno Valley, CA doesn't add tax if you pay in store. But they charge a $3 fee which ic okay with me. 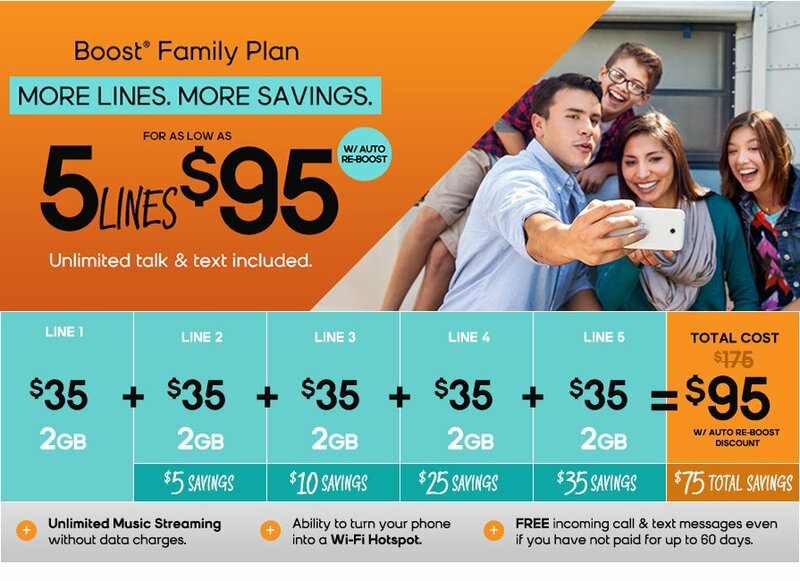 We have a family plan w/4 lines.